Bobby Robinson was a name I was unfamiliar with but after reading his obituary in the NY Times, I couldn't believe my ignorance. 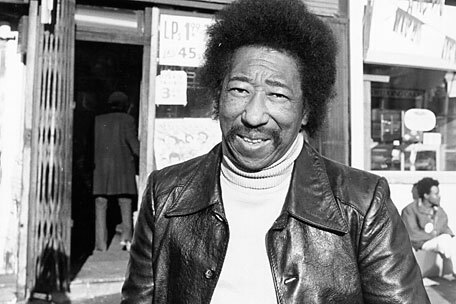 He was many things but at the top of that list was being an icon to Harlem (and a shining example of the American dream) for not only owning a legendary record store on 125th street for years but for being the man behind so many classic records from the 1950s until the '80s. I knew many of the artists ( Wilbert Harrison, The Shirelles, Dave "Baby" Cortez, Elmore James, Lee Dorsey, Gladys Knight & The Pips, King Curtis, Spoonie Gee, Grandmaster Flash & The Furious Five, Doug E. Fresh, and Kool Moe Dee) and his many labels (Red Robin Records, Whirlin' Disc Records, Fury Records, Fire Records and Enjoy Records to name a few) but somehow I missed that he was behind all of these wonderfully important things. In regards to American Music history I feel like his name should be recognizable to all, especially when focusing on the history of music made by African Americans. While I grew up in NJ (about a 1/2 hour outside of NYC), I wasn't old enough to know what was happening in NYC until the late '80s, long after Robinson's career peek. Sadly I never had the chance to shop in his store while it was still open and I wish really I was cool enough to attend the warehouse space parties in the Bronx where some of the first Hip Hop acts in American came from but at the time I was just a middle school dork living in one of the whitest communities ever with zero links to anyone in NYC, no less embedded in that DIY party scene. I am grateful to have this radio show to learn about all the things I missed out on and have really grown to appreciate all the incredible music Bobby Robinson had an ear for and released for other's to bring into their home or hear over the radio. Tonight from 7PM to 9PM I will be playing examples from his entire discography spanning all his various labels and genres. Together they tell a rich and remarkable story of music made by mostly African Americans on the East Coast for nearly 40 years. Only on WRIR (http://www.wrir.org/ - stream the show live) or come back to this post tomorrow where I will have a link to the whole show. My apologies. Due to a ridiculous number of technical difficulties tonight, there was no podcast. It was a minor miracle the show happened at all. Sigh, technology hates me.